The national program of technology enhanced learning (NPTEL) is an initiative of the Government of India to provide quality educational material to engineering students . 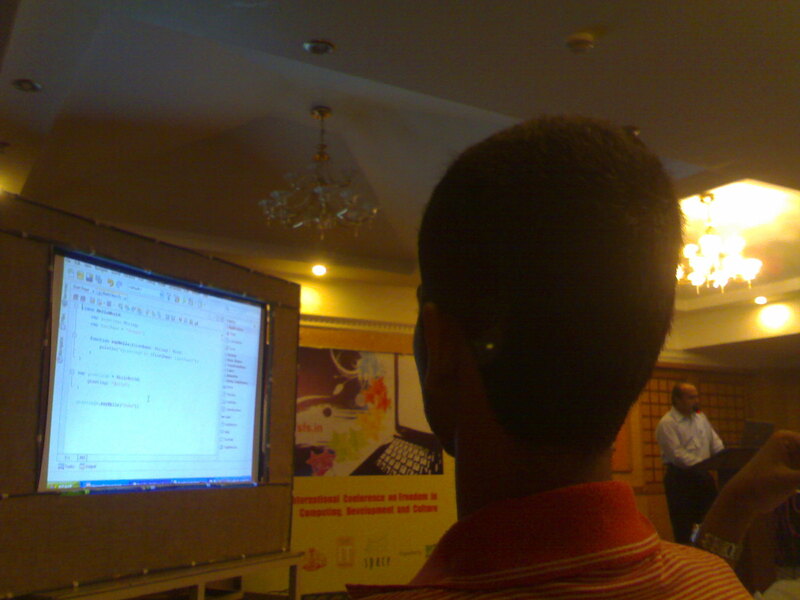 The site has several video tutorials for various engineering subjects. 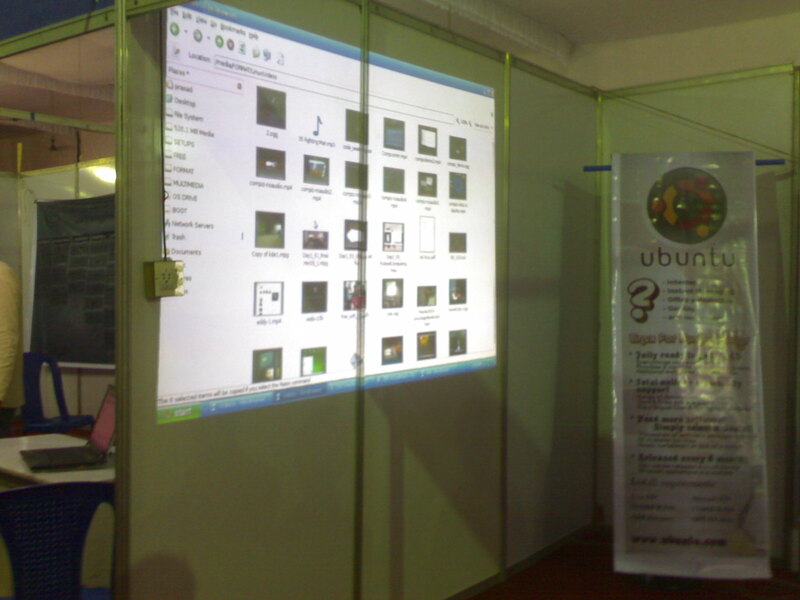 However, the site is not very popular among Indian students. I have been trying to promote it among my students and colleagues for quite some time as a source of quality material. But, the response is not very encouraging. The videos are hosted on youtube. The complete playlist is here. 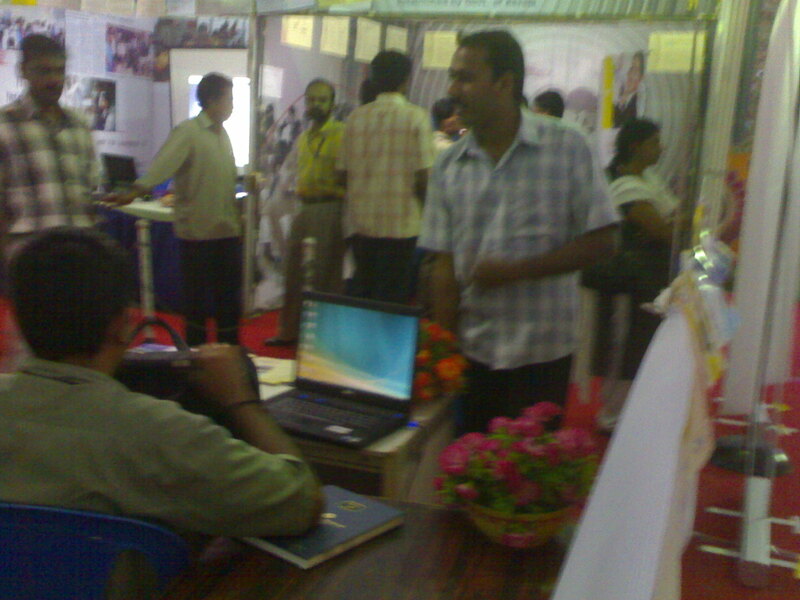 There are several course suitable for electronics /computer science students. Some of the so called “difficult” subjects are lucidly explained by senior professors. I have recomended the digital signal processing course by Prof. S C Dutta Roy as supplimentary material to my students. If you want to view the courses offline, you can download it form youtube using youtube-dl. The youtube videos are in flash (.flv) format. 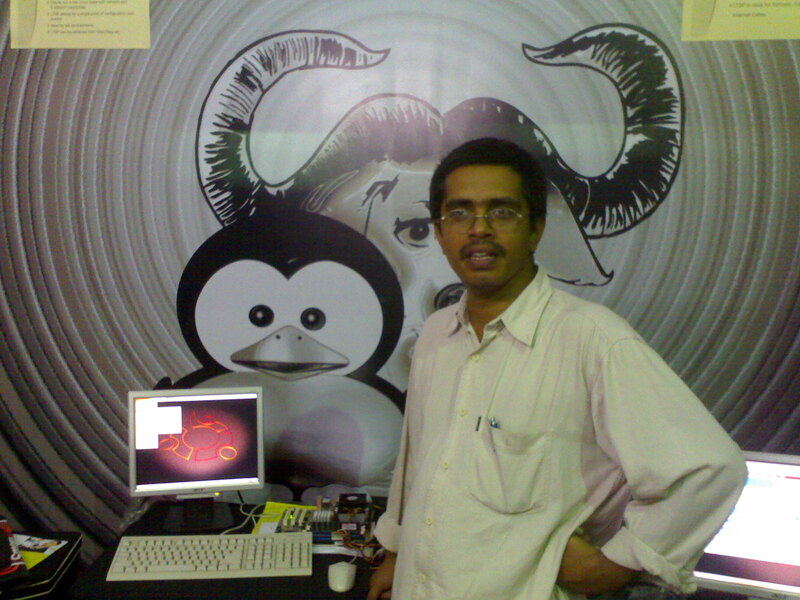 Softwares such as ffpeg can be used to convert them to your favorite format. 1) Can I make a payment for my client and then collect the money back from him? See the Challan report. It prints out the details of the PAN holder along with the bank account number from which the payment was made. I think you can make payments for third party, but keep your books clean. 2) Whether it is mandatory to pay tax online? 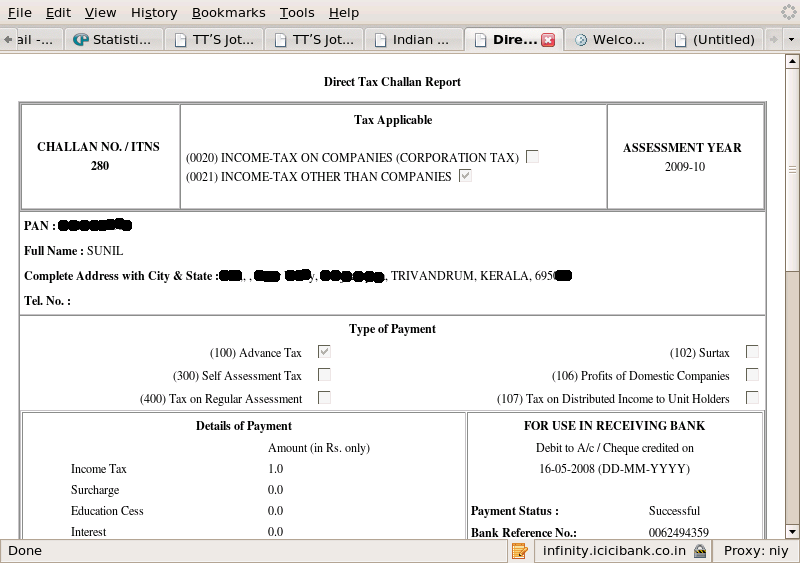 3) How can I know that I have completed tax payment ? A challan identification number ( CIN) given to you. Keep it. You can verify your o bank statement and make sure that the tax has been paid. 4) What I should do when I file the income tax return.? I have paid the tax by online payment. 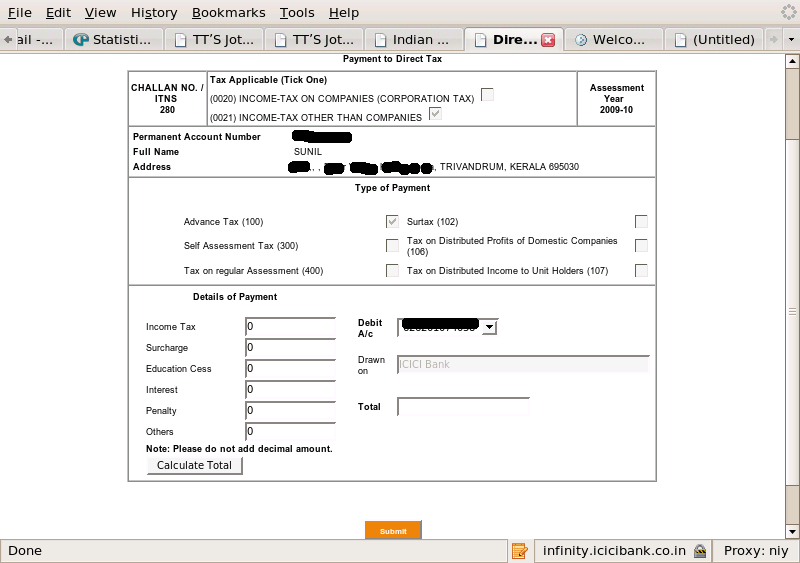 You can quote the CIN (challan identification number) in your income tax return. 5) I encounter several problems while making online payment. What I should do? 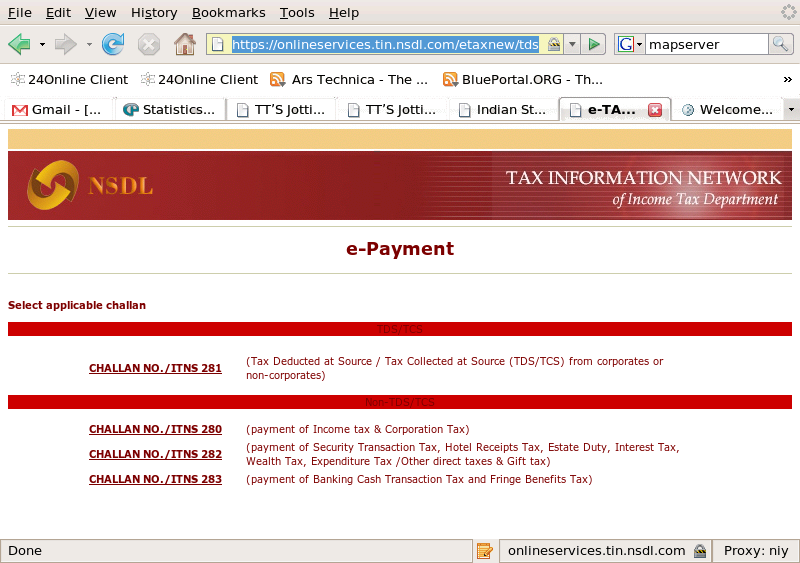 Problems can occurr at NSDL website ( during challan preparation)or at the bank’s site (during actual payment). 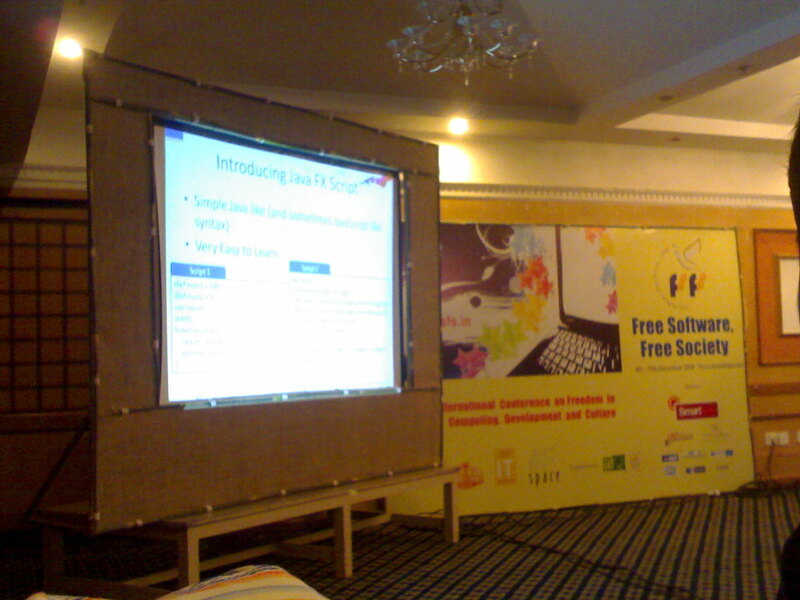 In the first case, you can call TIN Call Center at 022-24994650 or send an email to tininfo@nsdl.co.in . The subject of the email must be “e-payment”. If you encounter any problem while making payment at the banks internet site, you must contact the respective bank. 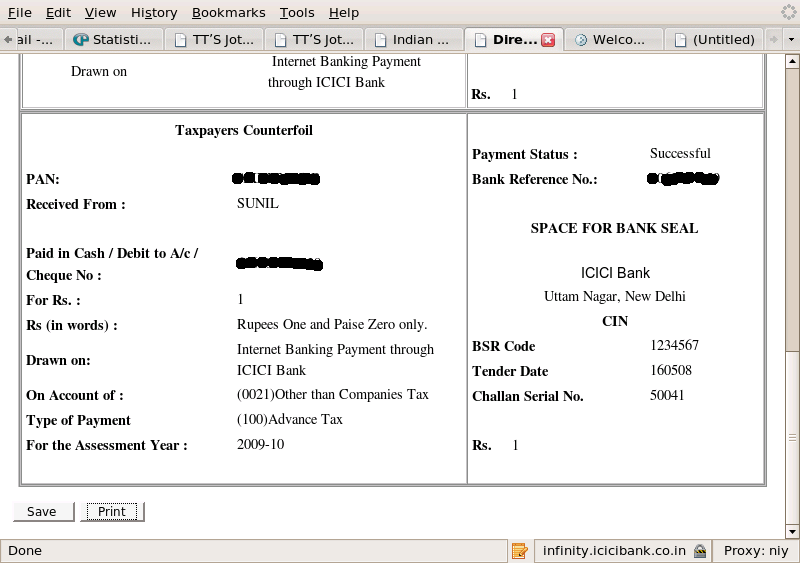 6) Whom should I contact if the counterfoil containing the CIN is not displayed on completion of the transaction? You should contact your bank. 7) If I have misplaced my counterfoil who do I contact? 8 ) How secure is the transmission of data to the website for e- payment? 9) How do I contact bank ? This file lists the address and phone number of the bank official to contact. Note that details about some banks are missing. 10) How do I check challan status? 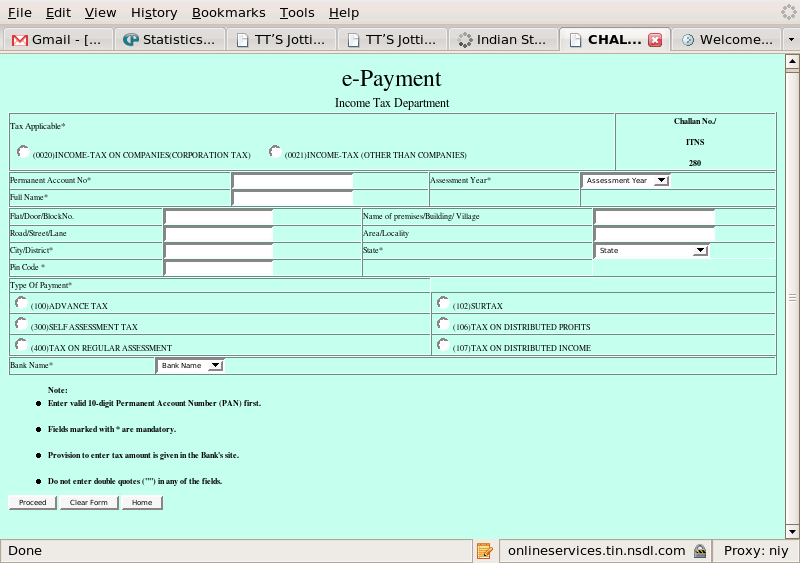 Government of India has recently started an e payment service for paying several taxes over internet. At present the following taxes can be paid over internet. This document will give you the step by step procedure for making tax payment. This document will provide a hands on introduction to the epayment system. 1) For payment of tax over internet you need an net banking enabled account with any of the following banks. 3) A printer. You have to take printout of the receipt and present it along with returns. Now open the site https://onlineservices.tin.nsdl.com/etaxnew/tdsnontds.jsp You will get the following screen ( if you want to see full screen images of screens shots used in this tutorial double click on the relevant image). 1 Enter valid 10-digit Permanent Account Number (PAN) first. 2 Fields marked with * are mandatory. 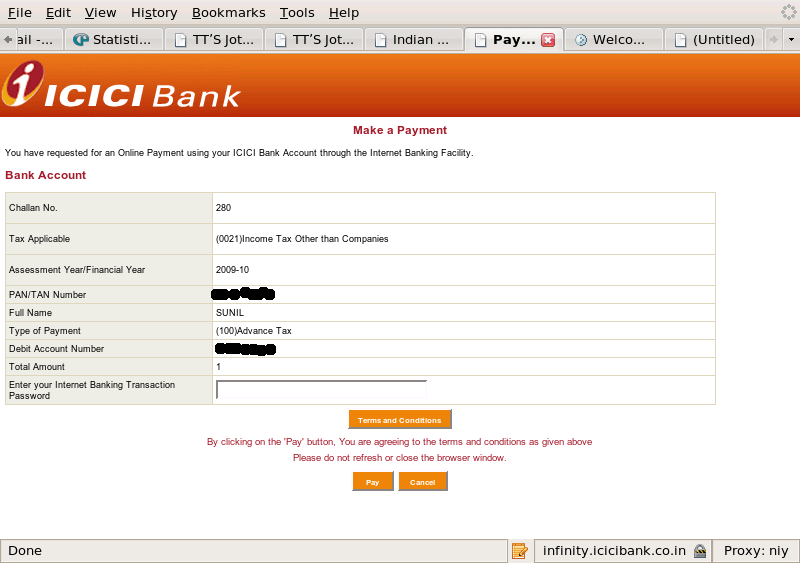 3 Provision to enter tax amount is given in the Bank’s site. 4 Do not enter double quotes (“”) in any of the fields. The PAN (permanent Account Number) number is a unique 10 digit number assigned to each income tax payee in India. The rest of the tax payment procedure will work only if you enter a valid PAN number. Also note that no amount is entered in the challan. You will be prompted for the amount at your banks internet site. Finally, note the last instruction. You should not enter double quotes in any of the fields. Now start filling the form. Most of the fields are self explanatory. 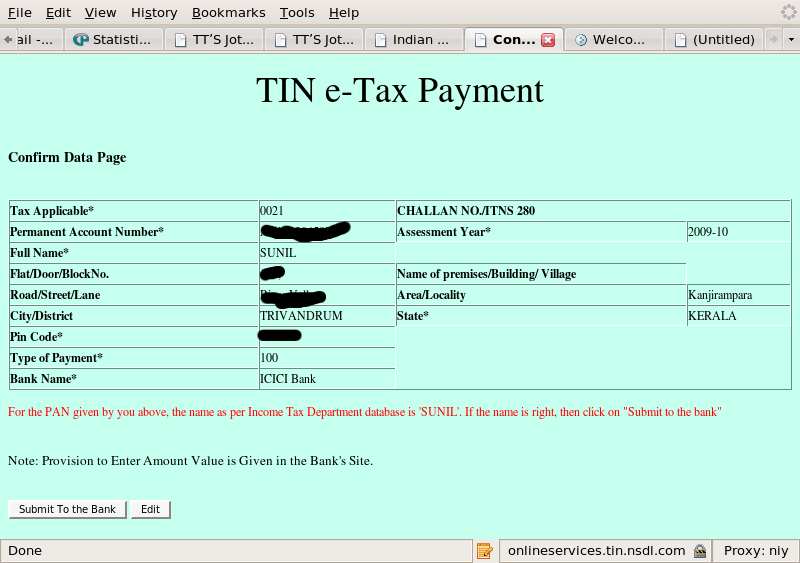 As soon as you enter PAN number , Income tax department;s server will be contacted and only if the PAN is correct the Bank name drop down box will be populated. Please note that if you are paying for the current financial year ( 2008-09), the assessment year will be next financial year ( 2009-10). You can also pay tax for other assessment years. Now submit the form. It will return the following page if everything is correct. (I have blanked my personal particulars,like PAN etc). Note the red line. It is asking you whether the name is correct. If you are sure about the name , you can submit the challan to the bank for payment. 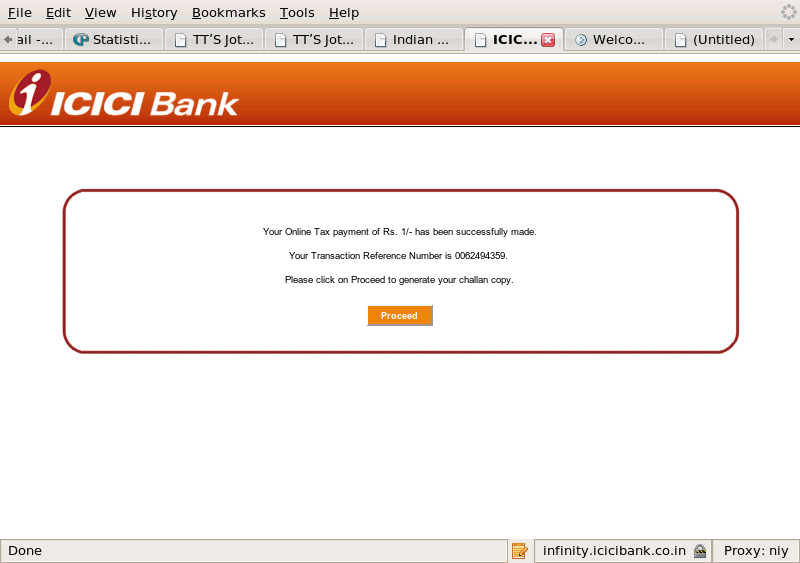 For ICICI bank I got the following screen. 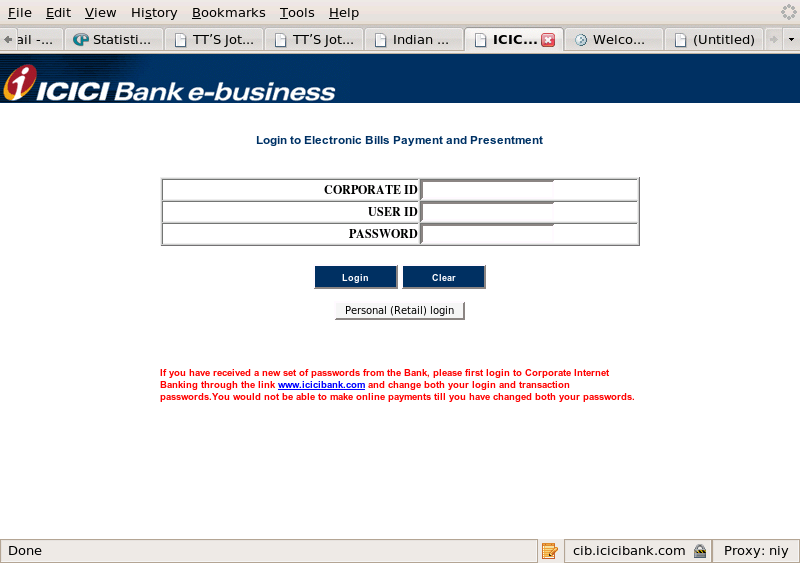 ( Other banks may have different login screens). Since I am not a corporate customer, I clicked on retail login. (This step may be different for another bank). This will lead you to this page. 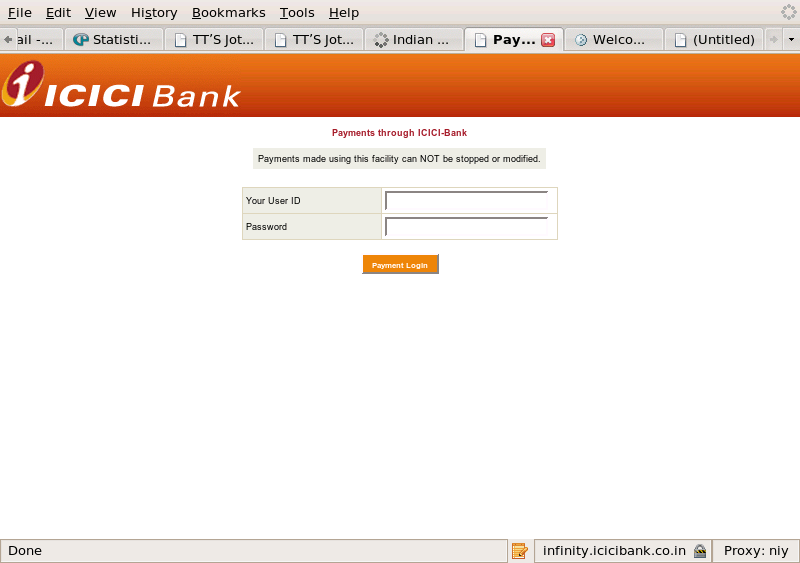 Type in your user name and password and then click payment login. Enter the password and click pay. I got the following screen. 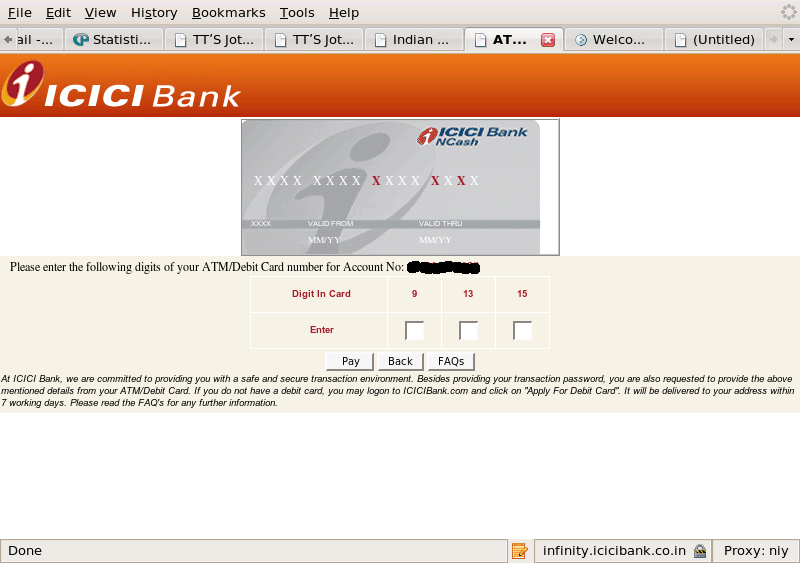 Here ICICI bank is confirming your identity. It is asking for 3 numbers on the debit card issued against your account. Get hold of your card and punch in the numbers. Then click pay. I got this screen with transaction id. Note down the id. Then click on proceed button to generate report. I got this screen. 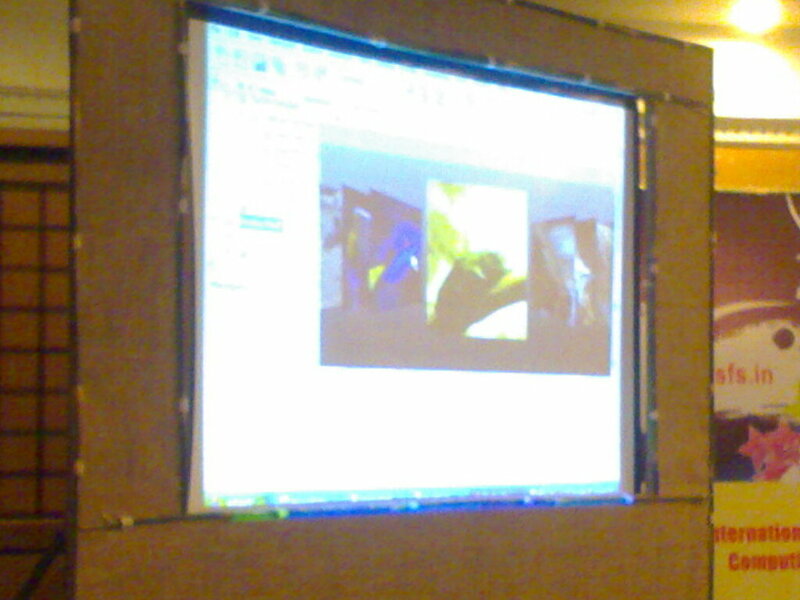 Here is rest of the screen. There are 2 options on this screen. You can save or make a print out. If you click on save a file named DirectTaxPaymentChallanReport.htm will be generated. . Rename the file immediately,if you are planning to make payments frequently. Now that the tax payment is done, you are at a dead end. There is no close button on the screen. You may close the browser manually.